Adorkable Aimee: Creating a water baby. 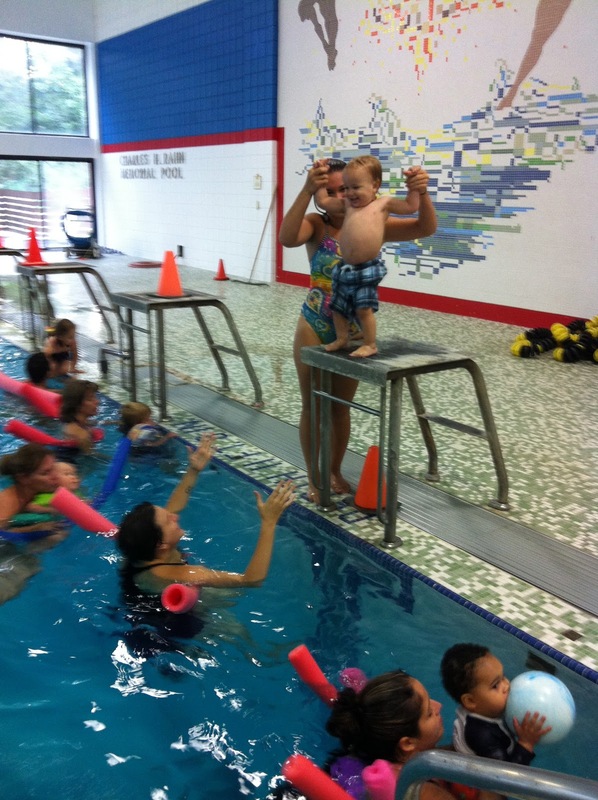 Tuesday was our last Swim for Tots class for the summer. The difference in the munchkin between the first class and the last class was remarkable. At the start of the summer anytime I took him near the water he clung anxiously to me. Tuesday he was practically leaping out of my arms to try an swim by himself. He was giggling, splashing, and kicking. He was able to crawl out of the pool by himself and jump back into my arms. He went underwater without a fuss. He squealed with delight when it was his turn on the slide. 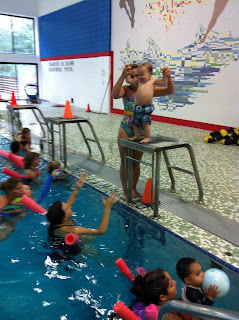 He happily went into the instructors arms so he could jump back into my arms at the deep end. It was a joy to see. By no means is he now a budding Michael Phelps, but he really is starting to seem comfortable in the water. The last time we went to the lake, he ran right up to the edge and walked in by himself. He didn't get freaked out when he tripped and his face went under. He never would have left my arms the first time at the lake. He really made great progress. I love swimming, so it was really important to me that he get comfortable with the water as early as possible. I wanted to start before he really had a chance to get scared. If he has some sense of the water and how to stay afloat, I will be much more confident to have him around water- like Michy's parents' boat. (Of course he will still wear a life jacket and be watched like a hawk!) It is also important to me to get him out around other kids. We are lucky that our schedules are flexible enough that someone can always be home with him, but it does mean that he doesn't get the chance to socialize with other kids very much. I am making an effort to get him out with other toddlers as often as possible. Here are some photos from our swimming experience. swimming back to the shallow end. Classes don't start up again until October, hopefully he won't lose his enthusiasm in the 5ish weeks we have off. I'm going to try to keep taking him to the lake until it gets cool. I love the underwater picture!